Firstly: a salute to Evlyn M, an artist who was formerly a vibrant part of the online OSR community, but who has since withdrawn as a result of toxicity in the scene. Evlyn does some absolutely charming work, and we are made much poorer by her departure. Secondly: a shoutout to Stuart Robertson, creator of the ubiquitous "OSR" logo, on taking a stand re: the usage (and misuse) of the logo. I haven't spoken out as forthrightly about misuses of community position and power in our community as I should have, and I'm glad that I've got another good example here to try and live up to. This post was inspired by a query on the /rpg subreddit, where someone asked for a simple way to generate a domain setup for his kids' game, and asked if it were possible to use the cardbuilder Dominion as a framework. I've written about using Dominion as a setting generation element before, but I think that this new query is a way to set up an evolving domain framework without too much back-end work. It's pretty abstracted, but if you had to do something in a pinch I think this could work. Play a 3- or 4-player game of Dominion. At the end, pick one of the decks to determine what resources the players' domain has - victory point cards mean territory, treasures mean fiscal resources on hand, and action cards mean buildings or resources within the fiefdom. Feel free to abstract meanings from the cards present - having a Golem in the deck might mean that the domain has a construct or warforged present...or, drawing upon the the original Golem of Prague story, it might mean that the polity has a strong and unflagging defender. Each month (or other 'domain turn'), the domain can expend resources to take on new projects and keep growing and improving. The victory point cards present at the end of the setup phase serve to increase the number of potential improvements and projects that a domain can seek to take on as a card draw from the randomizer deck for the next month - the players can choose what they want the fiefdom to try and construct/purchase (adding to the deck). They'll have to keep gathering gold and resources to get what they need for the fiefdom, though (unrelated to the money cards acquired in playing the setup game). Resources acquired through standard play sessions (treasure, magical artifacts, alliances) wind up being translated into cards for the fiefdom deck. The game text doesn't matter too much - villages don't give you +2 Actions, +1 Card on the domain turn, but just symbolize that there's a village associated with the fiefdom that's significant in some way. You're using the deck to generate opportunities for randomization, NOT playing a game of Dominion anymore. After playing an intro game of Dominion with three AI players, I win. My deck contains: 8 Estates, 4 Duchies, and 3 Provinces (Victory cards), 1 Cellar, 1 Village, 1 Remodel, 3 Markets, and 2 Mines (Action Cards). 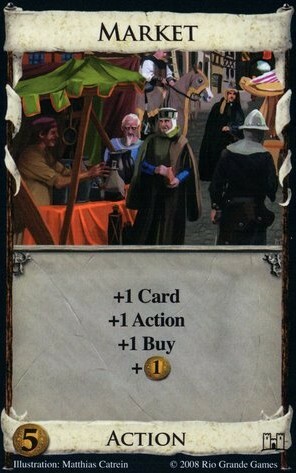 Translating the Action cards into domain resources: well, the two mines are simple, as is the village. 3 Markets suggest strong mercantile connections (as would make sense with two extant mines). The tricky ones are Cellar and Remodel, which have no easy direct analog. I might render Cellar as a series of storage vaults untouched through the various ages by the previous domain-holders (strange new swag for the PCs? ), and Remodel as the presence of a new builder who's able to start new construction projects right away. Now I need to translate the Estates, Duchies, and Provinces into draws from the randomizer. Each Estate is worth a quarter of a card (round down), each Duchy is worth half a card, and each Province is worth a card. This gives us 7 randomly selected cards that the domain will be able to choose its next upgrade from. The draw is: Shanty Town, Bridge, Mining Village, Spy, Masquerade, Caravan, and Laboratory. Mining Village suggests that there's been expansion around the mines and they're going to be more productive; Shanty Town suggests that the largest settlement in the domain has expanded, Bridge suggests that roads and infrastructure are developed further. Spy would suggest either the creation of an espionage network, or just developing information on one of your neighbors. Masquerade might be hosting a major social event, Caravan a greater focus on inter-domain trading, and Laboratory the creation of a wizard's or alchemist's sanctum. Some might (reasonably) suggest that the things listed are all things that a domain should be able to do anyway - why should mercantile expansion be limited by drawing a single card? Well, if you're looking for a very light overhead system, then that's just the random event that's available to you. If you want something that allows for a bit more player agency in the domain turns, then make these random events a bit more powerful -- the caravans here might be higher payoff, or reaching out to farther destinations, or the like. Unrelated, but have you played the Tea Dragon Society card game? It's a deck-building game too, but with really adorable dragon art. I had quite the same feeling after my first Small World game. I was "yup, this could definitely be the last centuries of a game world. The history is done, the people are in place, the map is here". I even had ideas where to put interesting dungeons given where the action happened and where the people were. Small World would be *excellent* for this as well! I'd want to curate the various races that were present (because I am one of Those People who's precious about what races go into my setting) but it would be great for both dungeon placement and city layering. * would it have additional territory cards (i.e. 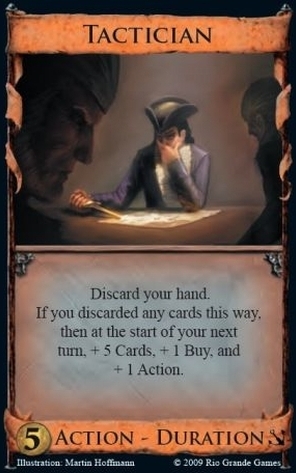 Estates, Duchies, Provinces, other VP cards) that if acquired would cause additional card draws in the next domain turn? Or do you see them as strictly acquired through in-game actions? * would you be inclined to weight the randomiser towards certain cards, e.g. only 1 Golem, but 5 Villages? I don't have a copy of Dominion but it'd be fun to pull together a similar randomiser deck from Magic cards.